So you need new uniforms… or hats, or bags, or travel suits, or any gear for that matter. Who do you call? Your team dealer. I won't go on and on about how working with a team dealer will do everything from save you money to help you choose the highest performing gear for your budget (but they do). Today I want to talk about how they can help you design your custom uniforms, whether you've already got a logo or whether you're trying to come up with something from scratch. I recently sat down with Jay Neveu who is our main customer-facing art manager here at SquadLocker to talk about the art customization process and tips for anyone looking to order customized apparel. 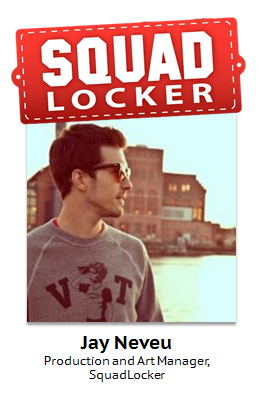 So what do you do at SquadLocker exactly? JN: My official role here is the "Production and Art Manager" - I handle everything from working with clients on their pre-production artwork and customization ideas to monitoring the actual production process to make sure everything goes smoothly and the customer gets gear they are thrilled to receive. Basically I help them get what they want, when they want it, with no "surprises" in how the finished designs turn out. What do you mean by "surprises?" JN: When you're customizing a piece of work, depending on the process – embroidery, heat applied graphics, etc – there are certain limitations on the level of detail you can go into. For example, there are size restrictions with embroidery since it is a needle and thread. Embroidered text lettering cannot go below ¼ inch before it becomes unreadable. So it's my job to make sure every mock-up and design we send to the client is true to what our machines can handle and what will be on the finished product. JN: I wouldn't say so. Any good team dealer should have some graphic artists on staff that make sure things like that never happen. I mean for me, the last thing I want is an unhappy customer. That means rerunning the machines, using up more inventory, time and money. I do everything I can to work with them to make a mock-up of the final design that they can really visualize. That's why we always send over the designs "to scale." Sometimes I will even tell them to print out the proof sheet, cut it out, and lay it on top of a jacket or a polo shirt or whatever they ordered so they can get an idea of the logo sizing. Is there usually a lot of back-and-forth between you and the customer on altering the design for stuff like that? JN: It fluctuates depending on the order and product. Usually most customers come to me with a logo in mind, but they may not know exactly what font they want, for example. I have no problem showing them various “athletic” or “block” fonts that I think will look good for the application and flow with the team. I'd say 90% of the time people come to us with an existing logo and pretty much just say "we want this in white on the back of our shirt." I take the design they send us, make any adjustments I know I'll need to make before I send it into production, and send it back to the client for approval. Occasionally they'll ask for some design that I know won't work and I have to tell them why and suggest alternatives – like if they want a large embroidered logo on the sleeve of their travel jackets with their highly detailed mascot in the middle, the school name up top and the team name underneath – I know that that's going to be a lot of stitches and look ridiculous. So for things like that I caution them against it, or I show them how big the design would have to be to fit all that detail. And what about the customers who don't already have a logo? JN: It's not that they don't have a logo, but sometimes they may want a new version of it – to freshen it up. Just recently I was working on a logo for a football team and I sent the coach over a proof using their current logo. He emailed me back explaining that they've been using that logo for the past 5 years and were tired of it. He attached a photo of a logo he saw that he liked and asked me to try to duplicate that or combine certain design elements of the two. The end result being something crossed between the two and he loved it immediately. They're now getting that printed on about 75 red Under Armour locker tees and won’t have to look at the same old boring design anymore! Do you do all this design work for free? JN: For most of the standard preproduction art work, like proofing the customer or typesetting text logos, we do for no charge. Some dealers tack on a charge for stuff like that, some don't. But for people who want custom logo designs from scratch, then we have to charge them. It sounds like the extra art work and advice is a nice perk for working with a team dealer. What would you say are other advantages team dealers bring to the table? JN: I mean really being the "experts" is the biggest thing. I put dozens of designs through production every day, so I'm very familiar with the process and how everything comes out. Like I said about the embroidery sizing, that's not something most customers would know themselves, and if they went and found someone who would try to do that for them they wouldn't be happy with the results. Team dealers who customize gear as their job know what looks good, and we can give you advice so your gear comes out looking good too. Do you have any tips for people looking to order new uniforms? JN: Work with a team dealer, haha. But from my point of view, it does help to have a design in mind or at least a starting point, and be involved/responsive in the design and approval process. I really do recommend printing out the logo or at least using a ruler to get an idea what the sizing looks like to make sure you're 100% happy with it before you approve the job of 120 sweatshirts for your school. Alright Jay, thank you so much for your time! If you're at the stage where you're shopping around for new team uniforms, request a quote and artwork mockup on any of our existing packages, or request to mix and match brands to create your own.